The volumes in Econometric Exercises are intended to be much more than a collection of several hundred solved exercises. 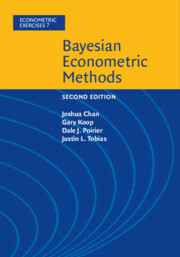 Each book has a coherent and well-organized sequence of exercises in a specific field or sub-field of econometrics. Every chapter of a volume begins with a short technical introduction that emphasizes the main ideas and overviews the most relevant theorems and results, including applications and occasionally computer exercises. They are intended for undergraduates in econometrics with an introductory knowledge of statistics, for first and second year graduate students of econometrics, and for students and instructors from neighboring disciplines (e.g., statistics, political science, psychology and communications) with interests in econometric methods.